Nepos the Nose is an elderly nightblade who lives a luxurious life in Markarth. He works for Thonar Silver-Blood by "handling" any situations with the workers. At first glance he seems to be nothing more than a wealthy old man. However, upon investigating recent Forsworn attacks it is discovered that he is, in fact, responsible for the deaths of many innocent people. Nepos lives his life in seclusion and never leaves his upper-class house in the Dryside of Markarth. He is constantly surrounded by his servants and spends all of his time in front of the fireplace inside his house, carefully studying a book. He wears fine clothes and a pair of fine boots. He is equipped with a steel sword and carries his house key, a large amount of gold, and several rings and amulets which are usually worth a considerable amount of gold. In addition to his blade, he also knows the spells Oakflesh, Raise Zombie, and Flames. Betrid: "Did I hear correctly, Thonar? Is your brother really asking you to settle another dispute between Mulush and Nepos?" Thonar: "Someone has to keep the silver production running, Betrid, and that means keeping Mulush and Nepos in line once in a while." Betrid: "Humph. Who's running the Silver-Bloods? You or your brother? You need to tell Thongvor that he should settle this himself or step down." Thonar: "The only thing I need to do, dear wife, is make sure profits are up, no matter what. If Thongvor won't do the dirty work, I will." Betrid: "You'll never be in charge of this family with that attitude, loving husband." While all this seems innocent enough, Nepos still has enough enemies to be under the protection of his maid, Uaile. When you enter the house, she will stop you right away and ask: "Excuse me. What's your business here?" You will have three options, all of them leading to the same sort of reply: "We haven't been expecting you, and the old man needs his rest. Come back some other time. ", "If you must know, I'm the maid. And the master of the house is old and needs his rest. So if you don't have any business. Leave." and "This is a private home, and the master of the house is a very old man. He's not to be disturbed." If you head inside anyway, Nepos will just sit in his chair with nothing to say and keep up his appearance as a law-abiding citizen. When local smelter worker Eltrys asks you to investigate the assault on Margret, the last in a long series of assaults involving the Forsworn, thus starting the quest The Forsworn Conspiracy, Nepos will turn out to be heavily involved in the many shady dealings in the City of Stone. As you investigate Weylin's room in the depths of The Warrens, you will find a note signed with the letter 'N', ordering Weylin to strike fear in the heart of the Nords. Outside of the Warrens, Dryston will seek you out and invite you to an unfriendly brawl, in an attempt to stop your investigation. After a good beating, Dryston will admit: "Nepos is in charge. That's all I know." and "I was sent by Nepos the Nose. The old man hands out the orders. He told me to make sure you didn't get in the way. That's all I know, I swear!" Additionally, Dryston carries a note to a friend, mentioning Nepos the Nose as his employer. From his hiding place in the Temple of Talos, Eltrys will be quite puzzled about this information: "Nepos the Nose? He's been in Markarth forever. And he's well-respected among the natives of the Reach." Eltrys will, however, suspect that Nepos gets his orders from somewhere above, saying: "Good work. Here's your gold. I have a feeling Nepos gets his own orders, though. If you find out, I'll have more for you." When you enter Nepos' house, things will be the same as always and Uaile will stop you right inside the entrance, although she will not get a chance to finish her sentence before the old man speaks from his spot near the fireplace: "Wait. It's okay, my dear. Send him/her in." Uaile will be unhappy with that decision, saying: "Hmph. Yes, Nepos. You heard him. Go on in." As you approach Nepos now, you will find a more talkative person: "I'm sorry about my housekeeper. She's a little protective of me. Now, what is it you want?" Nepos is obviously ready to talk, and you have three options, all of them exposing him to be part of the Forsworn: "Ah, yes. You've proven to be a real bloodhound. Well, you've sniffed me out. I've been playing this game for almost 20 years. Sending the young to their deaths. All in the name of the Forsworn. And I'm tired. So tired." Once again, you'll have three options, but with slightly different replies. When asked why, he will say: "Because my king told me to. Madanach." When asked who is behind the scheme, he will answer: "My king. Madanach." If you claim he is a monster, he will say: "A monster? No. I'm just a servant. To my king, Madanach." All three replies ends with an elaboration: "When the uprising fell at the hands of the Nords, they threw him in the mines. I don't know how, but he lives. I get his messages, and I hand out his orders without question." Once again, three options are available. First, he will tell you about the uprising: "Markarth and the Reach are our lands. That is why we are the Forsworn. We cannot claim the home that is rightly ours. But then during their war with the elves, we had our moment. We drove the Nords out of the Reach in a great uprising. Then Ulfric and his men came. Those of us who didn't run were executed, except for myself, my king, and a handful of others." He will then tell you about Madanach: "He is the King in Rags. A man who once held all the Reach within his grip. He stokes the passions of the downtrodden in this city. Directs them to kill the enemies of the Forsworn in our name. All from inside Cidhna Mine. A Nord prison. The irony is quite thick." Lastly, ask him why he is telling you all this, and he will calmly respond: "My dear boy/girl, what makes you think you're getting out of here alive? You were seen coming in. The girl at the door is a Forsworn agent masquerading as a maid. You aren't the first one to have gotten this far. You won't be the last." At this point, all of his servants—Uaile, Tynan, and Morven—will draw weapons and attack, along with Nepos the Nose. After the battle, you will find that Nepos carries a regretful journal, explaining his deeds and just how tired he was of carrying out orders for the Forsworn rebellion. Nepos's death can be avoided by pickpocketing and reading Thonar's or Nepos's journal instead of questioning them, then going directly to Eltrys. 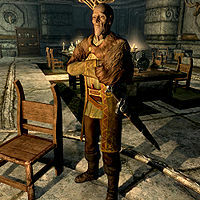 If you managed to pickpocket the information and avoid conflict, entering his house after completing "The Forsworn Conspiracy" will cause all four of the occupants to attack you. This page was last modified on 16 May 2017, at 21:32.